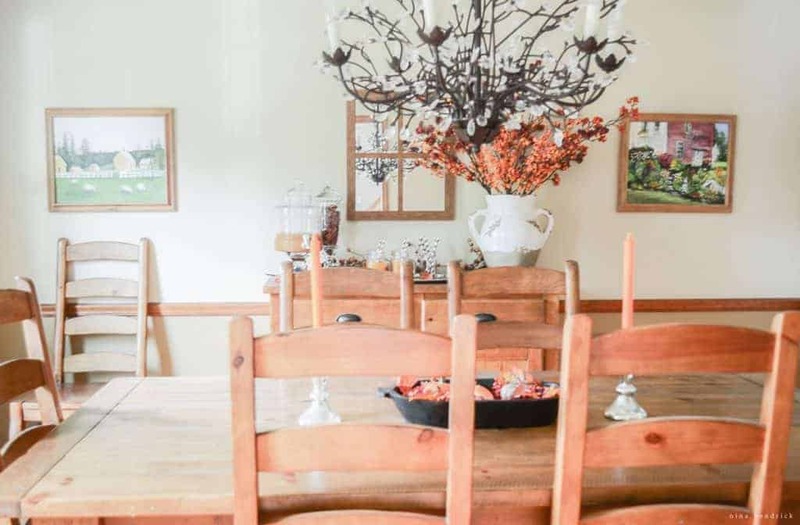 Step inside this classic blogger fall home tour and gather autumn inspiration ideas from the pumpkins, foliage, and a warm cider bar. Along with Ariean at One Krieger Chick, I am hosting “An Autumn Welcome” Home Tour. I am so excited to tour the homes of 35+ Creative Bloggers this week. I can tell you that I’ve seen the previews, and these ladies have some seriously beautiful homes! Make sure to check them out at the bottom of this post. The first taste of fall in our home is the entryway! I fell in love with these colorful pumpkins and I knew I just had to have them. I will fill up my “Pomme” bucket with apples as soon as we go apple picking, but for now, this was the perfect home for some extra branches. The window mirror is still residing in the entryway for now- I love that it can be used for any season. To the left of the foyer is the dining room. Although we haven’t updated the paint yet, I’m actually growing fond of the warm colors in this room. It works especially well for fall! I’m still on the hunt for the perfect table runner. For now, I have some autumn potpourri in my dough bowl. I love the colors, textures, and smells! Come on in for a mug of cider! I love setting up the buffet with seasonal drinks or desserts. This cider bar will definitely make an appearance for our fall entertaining. 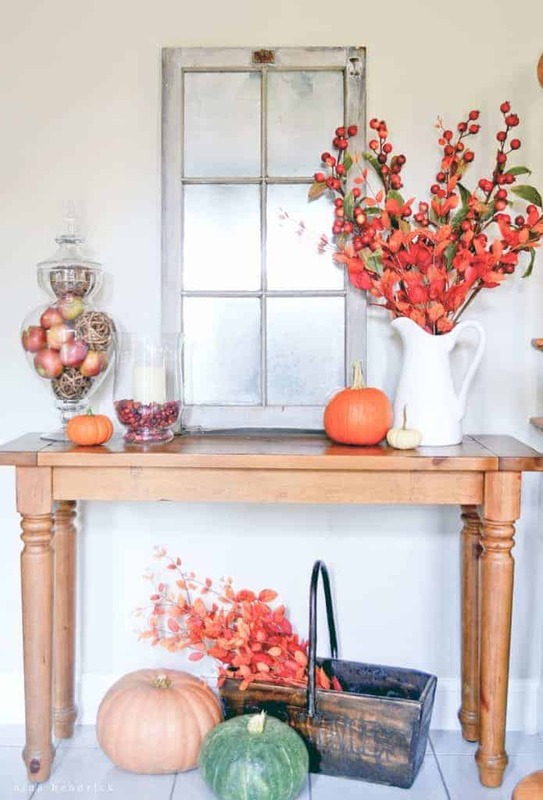 I brought my large urn into the dining room for fall and filled it with a variety of faux berries. The wall ultimately needs a larger buffet, but the fullness of the urn and berries makes it look a lot less empty! I created this mini-gallery and vignette in the family room above our new ikea hack apothecary console. It is still changing frequently, and I’ve already started to transition it to Halloween with dark pieces. Here’s a close up of the print I created. This saying by F.Scott Fitzgerald is my absolute favorite fall quote. 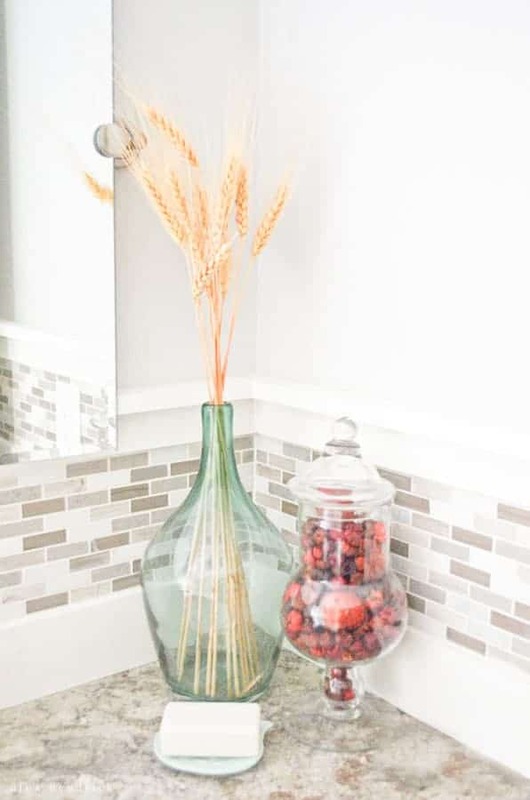 The powder room even got a little fall flavor with wheat and a jar of pumpkin potpourri. I always have grand ambitions to decorate every single area of my home for the seasons and holidays, and maybe someday I will be there, but for now this is a good start :) Make sure to check back for updates as my fall decor evolves and we transition to Halloween and Thanksgiving! 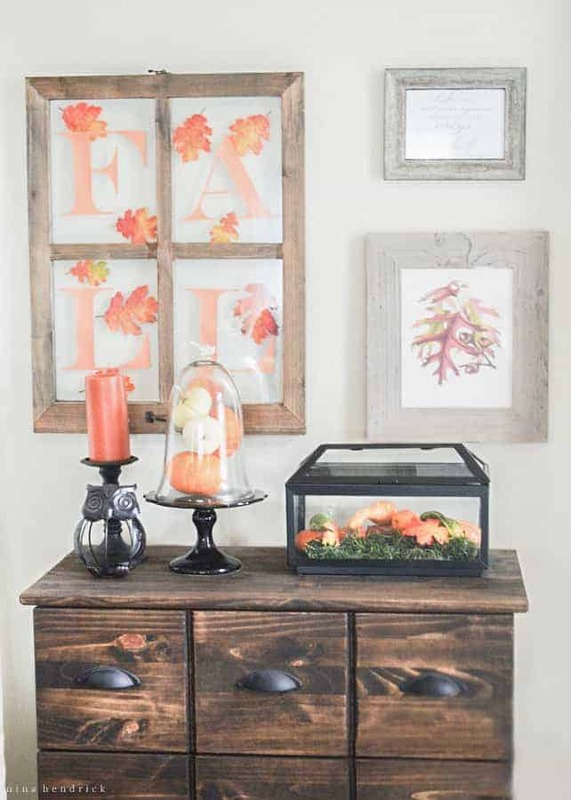 Love the fall decorations and pops of orange and red throughout your home. I especially love the console table with the old window and the cider displayed on the buffet in your dining room. I wish I could grab one and just start drinking :) Thanks so much for sharing your lovely home. Have a great week! I seriously love your home!! We just bought a flat, and we are still working on getting all the furniture, so I haven’t been able to concentrate in the decoration… i got some pumpkins and signs when I was in USA last year (my cousin still can’t believe i fit 2 pumpkins in my luggage! But they were so cute with glitter and a light inside, and of course we do not have stuff like that here in Barcelona!). My home still feels very new and I am trying to give it a little more charcter. I am sure all your ideas will be very useful when the right time comes! 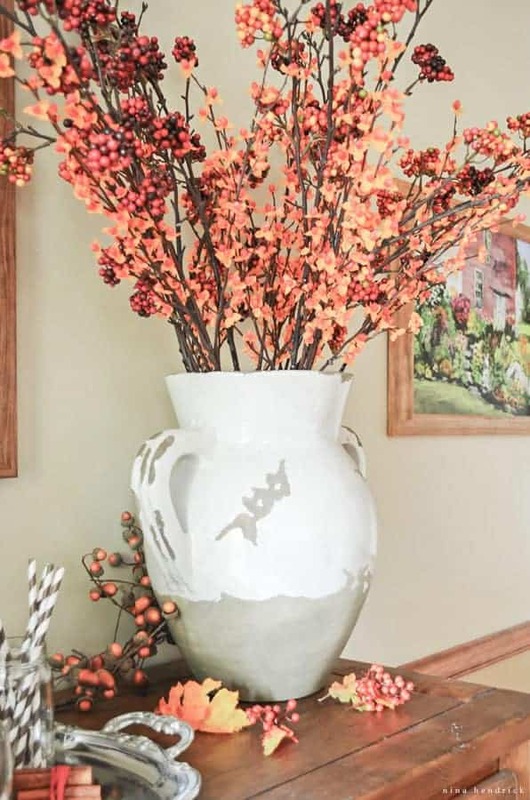 LOVE how you used fall colored branches in your white pottery vase. I received a similar one for my bridal shower earlier this year and I haven’t figured out what to put inside. Thanks for the inspiration! Love it! I officially need an apple cider station and love the Fall sign in the old window! 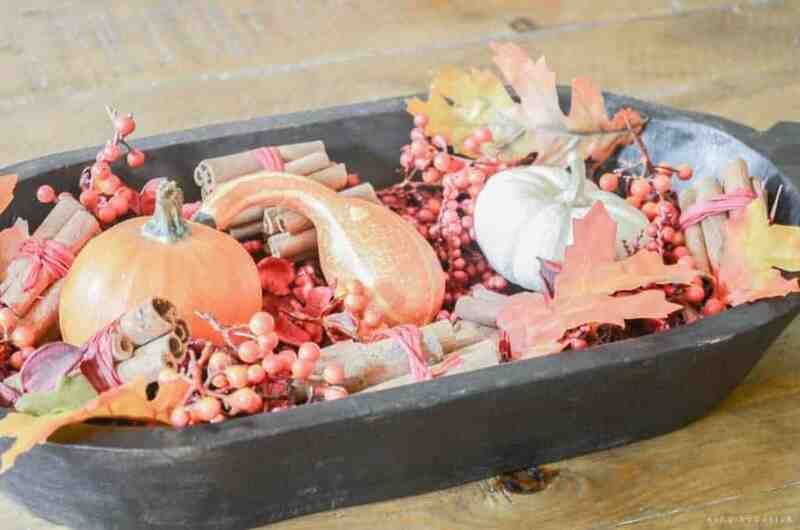 Beautiful fall decorating! I love all of the orange…fantastic! Beautiful! I love the Fall window and all of the details! So fun that I discovered you today through this hop! Absolutely lovely, Nina! Your home looks so cheery for the fall. :) Thank you for organizing this tour and for sharing your beautiful home with us! So many thoughtful and creative touches! I love the colours. Your buffet set/display is my favorite so far!! The cider displayed & in the cute cups is darling & so festive!! Your home is lovely Nina.. Love the printables! 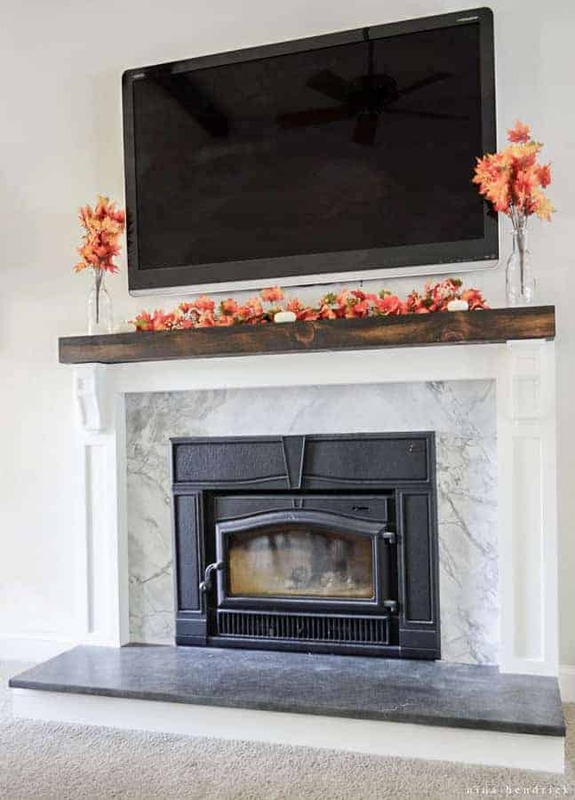 I love how your fireplace turned out, too! Happy Fall! You went all out! I LOVE the fireplace makeover! Oh and the Pomme basket you’ll use for apples… adore. Great tour, Nina! You have so many great vignettes and bright fall colors! Lovely home Nina! 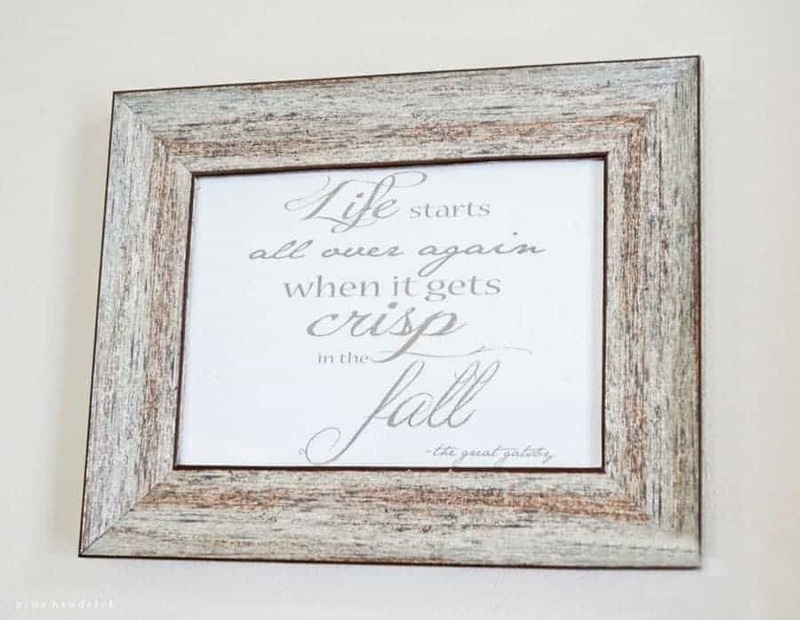 I love fall too and I agree with the quote “Life starts all over again when it gets crisp in the fall”. 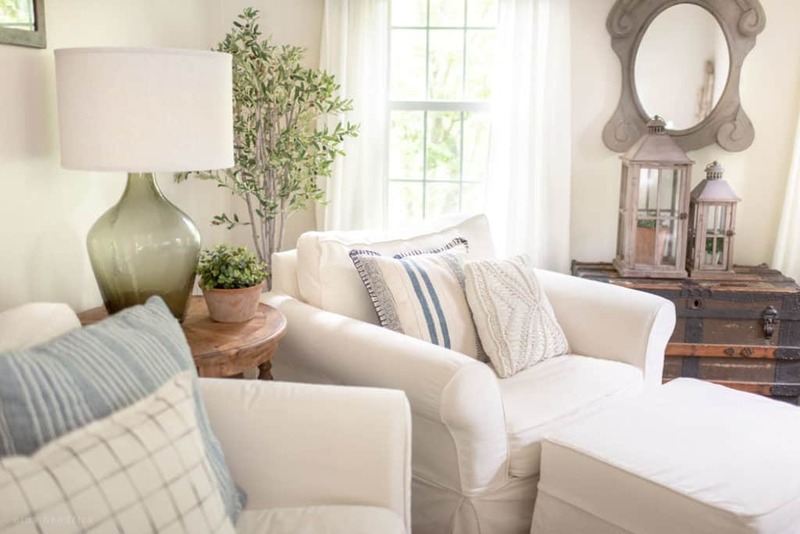 Nina, your home is beautiful and I am totally obsessed with that “Pomme” bucket! Your photos make me want to grab some apple cider at the beverage bar and get all cozy. Thanks for sharing! Your home is so warm and inviting! Perfect for Fall! 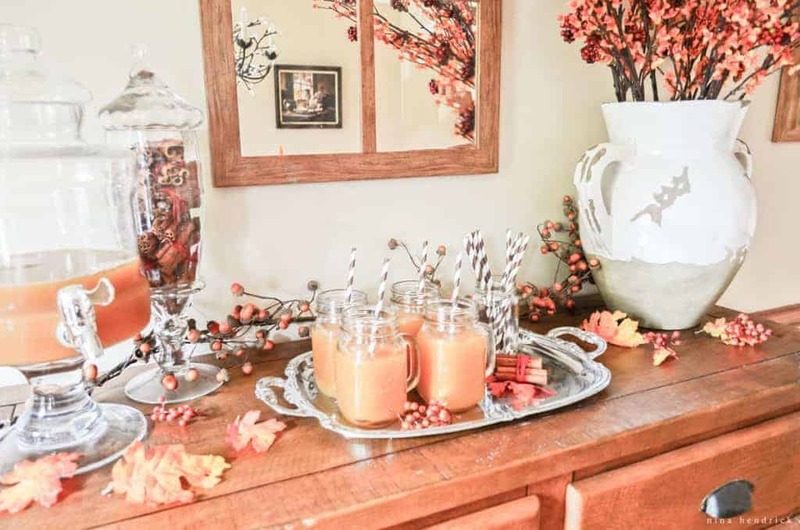 So many pretty fall vignettes, Nina! I love it- thanks so much for organizing this all, I love all the inspiration!! I too am obsessed with all things fall -my favorite season! As for your table runner dilemma, use a wide strip of burlap, fringing the sides. 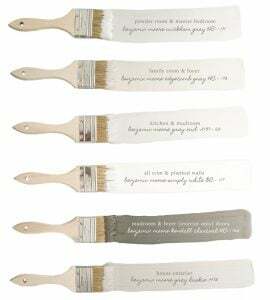 Would be perfect with your rustic table and decor!